Would you like chickens with that? : Doctor Who? 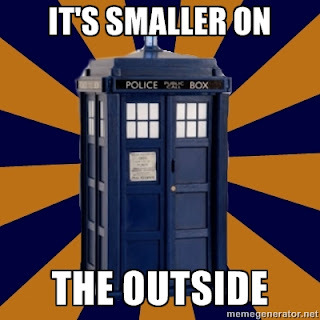 How do you explain Doctor Who to someone who has never seen it before, or even never heard of it? This may only make sense if you've seen the 2012 Xmas special! I've been attempting this with our new German exchange student, and telling her 'it's about an ancient alien who travels through time and space in a blue phone box, and takes people away with him' makes very little sense and makes the Doctor sound a tad serial-killer/stalker-ish. Also the whole regeneration thing sounds well suss. It is kind of hard to sum up this culmination of 50 years of British eccentricity in a few sentences. It's been part of my life for as long as I can remember, so it takes a real cultural mind-set shift to be able to contemplate how you could exist without it in your life! If you're a Whovian, how would YOU describe Who to a newbie? And yes, I named my cat after a character in it.